Sloppy. From the field conditions to the missed tackles to the dropped passes, it was all sloppy. The Aggies were going to win this game regardless of play or personnel. Coach Sumlin knew this and showed it when he opted to not start the two critical players that run the offense and defense. Both sitting out to rest minor injuries, Mike Matthews and Jordan Mastrogiovanni proved their worth in their absence. The offense seemed disjointed and the defense showed serious tackling issues often stemming from players out of position. Although the final score read Aggies 38 against the Owls 10, the game itself seemed much closer. Credit to Rice for implementing a clock control game plan thus keeping the A&M offense on the sideline for long stretches. When all was said and done, the A&M offense only saw the field for 16 out of 60 minutes yet still put up 477 yards of offense. Defensively, the Aggies showed little improvement from last season’s gut check. 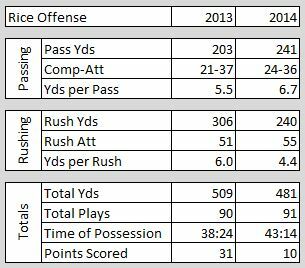 As mentioned in Friday’s game preview, the matchup against Rice would provide the Aggies their first opportunity to compare year over year progress from last year’s unit. Taking only the final score into consideration, there was big improvement. However, in every other major statistical category, the Aggies left much to be desired. True the Aggies rested a few players on defense. But this was no different than the Aggies missing several defensive players due to suspension in last year’s opener. Furthermore, last year’s unit was playing their first game while this year’s unit has already seen two different opponents. The most notable area of improvement came on the defensive line which is to be expected. After giving up 6.0 yards per carry last season, they improved to 4.4 yards per carry. However, this was still a far cry from the 3.0 YPC that they held South Carolina to and the 2.4 YPC that they held Lamar to. Look for the coaches to use the tape from the Rice game to refocus the team. Although the Aggies should have no trouble with SMU this weekend, conference play looms. Arkansas appears to be much improved over last season and Ole Miss entered the season as a dark horse to win the SEC West. Both will prove critical tests and a measuring stick for the Aggies this season. Kenny Hill became the first Aggie to hit the 1,000 yard passing benchmark in the first 3 games. He currently has 1,094 yards, 11 touchdowns, and 0 interceptions. Myles Garrett was phenomenal once again. He had 2.5 sacks along with another 3.5 tackles for loss. He is exceeding the very lofty expectations that people placed on him this season. And at this pace, he will post 22 sacks on the season! By the way, the SEC record holder for most sacks in a freshman season is 8 and is held by Jadeveon Clowney. Both Speedy Noil and Zaycoven Henderson sustained leg injuries seemingly caused by the unstable field conditions. Both players status are unknown at this time. This game saw several young players get much needed playing time. True freshman middle linebacker Josh Walker and second string linebacker Justin Bass started. Defensive ends Jarrett Johnson and Qualen Cunningham saw a great deal of playing time. Even cornerback Nick Harvey got into the action after Victor Davis was beat on Rice’s touchdown pass. For the 3rd game in a row, the Aggies have not given up a rushing touchdown. Saturday was a big recruiting weekend highlighted by visits from RB Jacques Patrick (5-star from Florida), WR Christian Kirk (5-star from Arizona), and DB Kris Boyd (4-star from Texas).